With public support for the death penalty at its lowest point in more than four decades, the U.S. will end the year with its fewest executions in a quarter century. Nationwide, 20 inmates were executed in 2016, according to a report from the Death Penalty Information Center. That’s the fewest since 1991, when 14 inmates were executed. 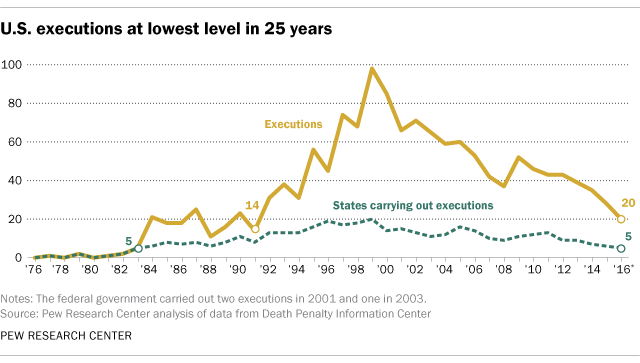 In every other year since 1992, the U.S. executed at least 28 people. Just five states – Alabama, Florida, Georgia, Missouri and Texas – accounted for all U.S. executions in 2016. That represents the fewest states to carry out executions in any year since 1983. In 1999, by comparison, 20 states conducted executions. Legal and practical challenges prevented some states from carrying out executions in 2016. Ohio, for example, has not executed anyone since 2014 amid difficulties acquiring the drugs needed to conduct lethal injections. The state announced in October that it will resume executions next year, using a new protocol. The number of death sentences imposed by the courts also declined substantially in 2016, reaching its lowest point since at least 1972, according to the Death Penalty Information Center’s report. The year’s 30 death sentences (including one that was expected but had not yet been imposed as of Dec. 21) are down from 49 in 2015 and 315 in 1996, the modern peak year for death sentences. Public opinion nationally has shifted against the death penalty, though support for it still outweighs opposition. A Pew Research Center survey conducted Aug. 23 to Sept. 2 found that 49% of Americans support the death penalty for those convicted of murder — a four-decade low — compared with 42% who oppose it. But voters remain divided along partisan lines. Nearly three-quarters (72%) of Republicans favor the death penalty for those convicted of murder, compared with 34% of Democrats. At the state level, voters this year showed renewed support for the death penalty. In California, which has the nation’s largest death row, voters rejected a measure that would have eliminated the death penalty and replaced it with a maximum penalty of life imprisonment without parole. Separately, they approved a measure that retains capital punishment but streamlines legal procedures related to death penalty appeals. In Nebraska, voters reversed a May 2015 decision by the state Legislature to abolish the death penalty and replace it with a maximum penalty of life without parole for the crime of murder. In a third state, Oklahoma, voters approved a measure intended to solidify the state’s death penalty against legal or legislative challenges by adding provisions to the state constitution, including a declaration that capital punishment is not cruel and unusual punishment. As of now, the death penalty remains on the books in 31 states. President-elect Donald Trump favors capital punishment and has said he will seek it for anyone convicted of killing a police officer. The federal government has not executed anyone since 2003, carrying out just three executions in the modern era of capital punishment. Note: This is an update of a post originally published Oct. 21, 2016.